Some anti-Israel BDSHoles conducted a sparsely attended rally in Oakland. After a pro-Israel woman showed up and wrote the “incendiary” message “The Nation of Israel lives” on the ground, one of these peace-loving leftists showed her some peace, love and understanding (hat tip: Pro-Israel Bay Bloggers). 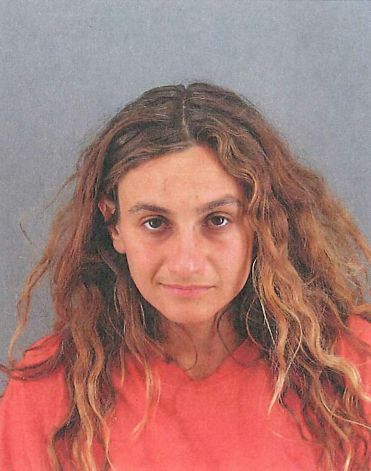 Here is a graduation photo police mugshot of the perpetrator Gabrille Silverman, from last year. On October 6, 2012, at approximately 2:50 P.M., a group of approximately 100 persons who identified themselves as members of the criminal street gang, Black Blok gathered at Justin Herman Plaza. The group began an unpermitted march westbound on Market Street. Many in the group wore black clothing and masks covering their faces as they took to the streets disrupting the normal flow of traffic. Officers arrived in the area and were immediately struck by projectiles thrown by members of this group. One officer was struck in the head and sustained non-life threatening injuries. Police issued numerous warnings that the march was unpermitted and those participating were in violation of the law and subject to arrest. Several vehicles and businesses in the Financial District were also vandalized by this group as they marched through the streets. Several of these persons then threw road flares and bags of paint at the officers. Some of these paint bags contained rocks, apparently intended to cause injury and damage to their targets. Several officers were struck with these “paint grenades” which covered the officers and their uniforms in paint. Due to the ongoing assaults against police officers and the threat to public safety, police moved swiftly to stop their progress and place them under arrest at California and Battery streets. A portion of the group broke through the police line and ran to the area of Pine and Sansome streets where they were arrested by additional officers responding to the scene. San Francisco Police made approximately 20 arrests from both locations combined. The suspects were booked on one or more of the following charges: conspiracy, riot, refusing to obey a lawful order from a peace officer; resisting, delaying or obstructing a peace officer; and assault and battery on a peace officer. A search of the arrested suspects’ backpacks revealed that many of them were armed with various weapons. The weapons included hammers, an ice pick, road flares, illegal fireworks, more bags of paint containing rocks and other weapons. Of those arrested, eleven were male and nine were female. Their cities of residence include one from San Francisco, and others from Oakland, Concord, Martinez, Newark, Mount Shasta, La Verne, Long Beach and San Diego as well as several whose identities and cities of residences have yet to be verified. Police believe that many of the persons in this group were also responsible for similar acts that occurred in the City’s Mission District on September 20th and 21st. During those events, numerous cars and businesses were damaged, residents threatened and at least one officer was struck in the head by a projectile, causing a non-life threatening injury. Silverman – otherwise known as “millipede” – is a tree-sitter and ISMer. Here’s hoping this video can be used as a basis for filing assault charges against her.